Yasodhara Hatha Yoga (YHY) is compassionate, gentle, student-centered yoga that meets you on the mat wherever you are. YHY focuses on self-discovery and nurtures the whole person – body, mind and spirit. 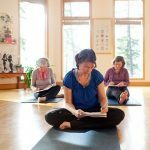 Yasodhara Yoga has its origins in the Saraswati lineage from Rishikesh, India and was brought to the west by Swami Radha, founder of the Yasohara Ashram on Lake Kootenay, British Columbia. REPLENISHING YOUR INNER SOIL 1/10-2/28, SOWING SEEDS 3/21-4/25, BREAKING GROUND 5/2-5/30. Cost is $54 plus tax. Interested in mining a single asana for the inner messages it holds for you? Then Hidden Language Hatha Yoga is the practice for you! For more information contact Lisa at 747-5985 or email her at anamcara39@gmail.com. Bring a journal and a pen! As requested! Here is the schedule! Contra-lateral movement, The Subtle body, and Integration. Yoga Integration® is a movement approach to embodying Structural Integration through Yoga. 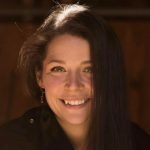 Crystal Bricker (Oostema), Certified RolferTM and Yoga Teacher will lead this powerful and informative workshop to help you understand your body and find integrity in movement like never before. Student will use 2 pinky balls to deliver self release techniques that that can use al home to relieve soft tissue challenges within their body. Every class will include an accessible anatomy lesson and self-care exercises to help manage chronic pain like plantar fasciitis and tension headaches.